What to do about mossy trees? Answers to any of the questions below would be very helpful. Our garden has, politely, been 'let go' by the previous owners for a few months and now us for a few years while we were working on the house itself. What have been nice shrubs and trees are now in trouble. Most are showing signs of distress, growing new side shoots and just dying slowly. They are almost all collecting lichens - which I'm told do no harm - and moss. We have a lot of moss. To the point that I'm going to have it instead of grass as it's easier not to fight it and it looks very pretty. And you don't have to mow it. Our garden, as you have probably guessed, is wet. And cold. We live high up a Scottish hillside, with lots of rain, and in a glen (dip) with a burn (spring) running through.Winters are hard, regularly sub-zero and often sub-snow or at least hard frost. Think Skyfall where Bond & M stop for a chat. Back to the trees....I think it may be the moss killing the trees, rather than colonising decaying wood as I'd previously thought. A silver birch has moss on the windy side to a height of about 4' and when I pulled it off the surface of the tree was quite rotten. It has few leaves now and they're on the end of high branches. This is just one example. Question 1) - is it the moss doing the damage or will it be wet/cold conditions generally? Question 2) - what do you think I should do about it? What I'm thinking where possible is to gradually balance out the new and the old with pruning to let the new shoots establish instead of the main tree. I've also mulched around the base of some trees with cardboard and grass clippings. Question 3) - will this kill the moss on exposed roots and the base of the trunks? Question 4) will pulling the moss off help or hurt the trees/shrubs? Any opinions gratefully received. Thanks for reading. Re: What to do about mossy trees? Freeranger wrote: Our garden, as you have probably guessed, is wet. And cold. We live high up a Scottish hillside, with lots of rain, and in a glen (dip) with a burn (spring) running through.Winters are hard, regularly sub-zero and often sub-snow or at least hard frost. Freeranger wrote: I think it may be the moss killing the trees, rather than colonising decaying wood as I'd previously thought. A silver birch has moss on the windy side to a height of about 4' and when I pulled it off the surface of the tree was quite rotten. It's possible the moss itself isn't killing the trees but providing ideal humid conditions for fungi and bacteria that do the actual damage. Having not been in a position where moss is a big problem, I had to google and found this Home Guide ... unfortunately to eradicate moss in trees means trying to eradicate moss in the lawn (because of the spore load) which seems like it might be more difficult given your location and conditions. Most sites recommend using physical methods to remove moss such as using a stiff brush. Just had a very quick google - you can use just water with a pressure washer to loosen moss or you can mix 1 cup water, 1 tsp liquid dish soap and 1 tsp veg oil then put in a very fine mister and spray on tree. There are two different mosses that I have found on line 1 x Spanish moss which you can remove by hand and one called Ball moss which has a dense ball like appearance that perches on other plants and does not sap nutrients from the plants it is on, but is not actually a moss! Apparently it is not a parasite, so would do no real harm apart from the weight of it which tends to distort branches and break them. Is the moss on the north side of the trees, FR? They say that is the usual place for it. Let me know what if any method you use and how you get on. Interesting replies, thank you, ladies. It sounds as though the moss is more a symptom than the problem itself. Reading the article, and the linked article from the RHS (picture exactly like our trees/shrubs), the problems are are to do with general maintenance. I have noticed that many are overly twiggy, with quite a lot of crossed & damaged branches. I think also that drainage and depleted soil are problems, so mulching around the trunks is something else I should look at. Maybe I should also try and keep the crowns more condensed so they are supporting less wood more successfully. There are things that grow quite well here - willows of various sorts are going great guns. I think I'll also try and use some of them to make wind-breaks. Maybe all of that will make for healthier trees overall. I appreciate the 'recipe' for removal of the moss, which is on the windward side. It's a very strong westerly, that crosses hillsides and an open field so brings driving rain and probably much of the moss with it. It actually looks very pretty in the summer but a bit dreary in winter. I might clean it off things like the silver birch that are meant to be features in themselves. There are quite a few trunk stubs where others have been felled, and out on the hillsides the wild deciduous trees are in poor condition and the surrounding forest has the larch disease - it's not just us. It's quite a dilemna - I wonder if it is worth getting an arborist in (hope I got the right word - someone who knows about trees) to assess what needs doing - rather than risk following a course of action you may think is the answer, they should know what really needs to be done. Ah, good catch, LL. Thank you. I suppose a bit of TLC as described can't hurt, even if it doesn't help much, and if I put willow uphill of these poorly species that won't be upwind so I can restrict myself to those. Luckily we have willow that really needs cutting back so I can use the trimmings. I've got a very tall cat willow, noticed it was dropping it's pusses into the pond (wonder what the rude word editor will change this sentence to this time). There are several little ones growing in the water. So I agree with LL about them liking damp. Don't weeping willows look glorious this time of year. The twigs seem to turn to gold as the buds start to come out. There are a couple of kitty willows by the burn, and I have made more by just pushing sticks into the ground - they take off really well. All the other kinds - like the more leafy ones - are the same. As I'm doing the garden on a budget, I'm going to use them for living fences etc. I don't have any weeping ones here and can't recall any in any of the local towns either. I'm not sure why that would be but I always imagine them in softer southern settings, so that's probably where they prefer. I'm sad to say I've discovered this morning that my favourite wygeila and a struggling azaelia appear to have snuffed it. Maybe someone would be able to answer this one for me....? When garden plants die, is it always because there is something wrong with conditions or husbandry, or do some just have a finite life? I know it's said that trees generally have a productive life, but what about plants? Freeranger wrote: When garden plants die, is it always because there is something wrong with conditions or husbandry, or do some just have a finite life? good question - I suppose finite would be the answer though there are some trees and plants that are almost 2000 years old but these are the exception rather than the rule (yew trees live a very long time. They also contain toxins which means fewer pests than say an oak tree) The older the plant / tree, the greater the risks such as fluctuations in climate (temperature / including flooding or drought), access to water and nutrients for growth, pests and pathogens. For example, a young tree might have x number of pests which it can tolerate because it grows at a fast rate whereas an older tree will be hosting a lifetime of pests and damage, allowing pathogens like fungus and bacteria to enter. Also, from an evolutionary point of view (think Darwen + long term), genetic variability allows survival of the fittest whether it is due to change in environmental conditions or attack from new pathogens such as virus, fungus or bacteria (for example, bacteria can multiply within a few hours at optimum temperature so each generation has potential to evolve and overcome a host's defences) Add on the carbon and nitrogen cycle, trees and plants that die will be consumed by saprophytes (like mushrooms) which feed on the dead tissue and release the carbon and nitrogen into the soil for new plants and trees to take up - without their contribution, the next generation will struggle to find nutrients. I imagine your question is about your garden plants than the grand scheme of things. 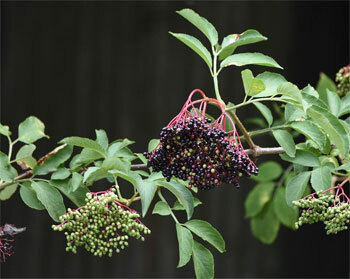 In this case, if an otherwise healthy plant (a perennial like a shrub) has been subjected to something that it couldn't tolerate - change in weather patterns (from typical warm & dry to cool and wet, drought or reduction in sunlight eg long periods of cloud cover or, as in the case of my garden, shade from growing trees), planting in unsuitable soil conditions eg lack of nutrients, soil pH, drainage or lack of in most cases, then yes the environment will have a big impact on a plant's health. Once weakened, pests and pathogens can decimate it. Thanks, LL - I thought you'd know. Fascinating answer, thank you. I suppose I should just view it all as cyclical and not feel depressed that things haven't made it. My natural tendency is to assume I've done something wrong, or at least something not right, else why would they die? I've lost a few things like peonies and astrantia which just didn't come up again one year. My weigela was being munched heavily last year by chaffinches, and we've had a long but of windy weather (but it's hidden behind a big holly tree) but nothing else changed. This year it hasn't budded at all, though the stems still seem green underneath. I haven't done anything differently, on account of I haven't normally done anything at all! The azalea is my fault because I realised last year it was struggling, being crowded out by the tree next to it but didn't get around to making it space. It has also just totally given up the ghost - no sign of it now. I feel that I'm making significant progress this year, having scrounged plants from a friend, but it is dispiriting to lose things and it feels like an uphill struggle. And the good news is that I saw some buds on the weigela - just a bit later than the rest. Being snowed on now, which I wish hadn't happened, but looking hopeful. Gwen, you asked me to give an update. I pulled the moss off one silver birch, which had disrupted the bark underneath, but it seems to have healed over. There's no obvious down turn in condition, but no improvement either.